Chillr is a mobile payment app that allows you to send / transfer money instantly to anyone in your phone book without knowing their bank details in an easy & secured manner. What are the features of Chillr? How to begin with Chillr? You need a smartphone with an active internet connectivity. Also, it is mandatorily that you should be registered for GoMo Mobile Banking facility with Saraswat Bank. Chillr is currently available on Android, iOS & Windows. To download Chillr App, goto your appstore, type & download ‘Chillr’. Chillr app is freely available on Android, iOS & Winows Mobile Operating system (OS). Chillr is very safe & secured. Each & every transaction executed on Chillr is authorized by your own MPIN only. Without a valid MPIN your funds cannot be sent to any beneficiary. Do I need any specific mobile service provider? No, Chillr app works with any mobile service provider. Only a working internet connection on your smartphone like 2G/EDGE/3G/4G/HSPA/Wi-Fi or higher is required. Is Chillr free? Are there any hidden charges? Chillr for Saraswat Bank customer is totally free. There are no charges for Saraswat Bank customers for sending money to other bank accounts. All transactions executed on the Chillr app are free of cost. There are no hidden charges to be worried for. Chillr works with all banks those are IMPS (Mobile banking) & UPI enabled with NPCI (National Payment Corporation of India). Saraswat Bank customer can also transfer money to other bank customers who are whether registered or not registered with Chillr. How to generate MPIN & MMID for Saraswat Bank account, if I don’t have one? Go to nearest Saraswat bank ATM, insert your card & under service option, select Mobile Banking Registration & generate MPIN. Download Mobile Banking application, register yourself by entering your debit card details or Net-banking details & generate MPIN. Visit Saraswat Internet banking, under services menu select ‘Mobile Banking Registration’ & generate MPIN. During registration process, my mobile number is unable to get verified, why? To ensure this, enter the same mobile number which is inserted in your Mobile’s SIM Slot one & which registered with Saraswat bank. Further, if your mobile number entered is correct, please wait for some time as it could be case of mobile network fluctuation. During registration process, I have multiple accounts in Saraswat bank, which account should I link with Chillr? Chillr will fetch all the details & provide you with the list of accounts which are currently linked with your mobile number in Saraswat Bank. You can link any of your account listed in Chillr as Primary account. Also, once you complete the registration process, you may link all your other accounts in Chillr through ‘Accounts’ option on Home Screen. What if I enter incorrect email Id? Chillr sends all transaction receipts & details to your registered Email id. Also, if you verify email id with Chillr, you will be able to set app-lock for Chillr. You can reset your account from ‘More’ menu & enter correct Email Id. Mobile Money Identifier (MMID) is a 7 digit number. Once you register for Mobile banking with Sarawat Bank, you can view your MMID in our GoMo Mobile banking app. It is mandatory that sender & receiver need to register for Mobile Banking facility with their bank to send or receive the money directly from Chillr. During registration process, I am getting the error of Generate MMID with Saraswat bank? To utilize Chillr, it is mandatory that you should be registered for GoMo Mobile Banking facility with Saraswat Bank. Download GoMo Mobile banking app of Saraswat bank & follow the registration process. Once you registered for the same, you can use Chillr app easily & conveniently. Do I have to know my MMID? No, during the registration process, once you enter mobile number, Chillr will fetch all the necessary details. Your MMID associated with your Saraswat Bank accounts will be fetched automatically. Do I have to know the MMID of beneficiary to send money through Chillr? No, you can directly send money by selecting beneficiary’s name from your phone contact list. Some of the names from my Phone Contact list are not being displayed in Chillr, Why? The names which are not displayed in Chillr must have not registered for Chillr app. If they have registered for Chillr, confirm whether the same contact number is stored in your phone contact list. You can also synchronize your contact list to Chillr manually by selecting ‘Sync contact’ option from ‘More’. Sync Contact is not working; all contacts from my Phone contacts are not displayed in Chillr contact list? If your contacts are not being shown, restart the app by cleaning memory. To do that press the back button to reach you home screen -> hold the Home Button and swipe to close Chillr completely. Restart the app. If you continue to face error, drop in a mail to support@chillr.in. What is the transaction limit for Chillr? The transaction limit for Chillr is Rs.25000/- per day & Rs.500,000/- per month. Can I set the transaction limit for Chillr? Yes, you can set the transaction limit for Chillr, by selecting your specific bank account under ‘Accounts’ option on Home screen. I have a single account in Saraswat bank, but not being displayed in Chillr? Confirm whether the phone number on your mobile device with which you are registering is the same as the number registered with Saraswat Bank. In case if it is different, you can update the number with any of nearest Saraswat bank ATM or change SIM to the registered number. Can I change my primary account linked to Chillr? Yes. In chillr, if you have registered with multiple accounts of Saraswat bank, you can change your primary account number from “Accounts” option on your Home screen. Can I remove my linked account in Chillr? Yes, you can remove account linked to Chillr, if you linked multiple Saraswat bank accounts to chillr. Will the money be sent and received in the same account that is linked with Chillr? Yes. All transactions made through Chillr would be credited to/debited from the account linked to Chillr. I maintain multiple accounts with Saraswat Bank, can I attach all the accounts in Chillr? Yes, you may link multiple bank accounts with Saraswat Bank to Chillr, which are linked to your Registered Mobile Number (RMN) through ‘Accounts’ option on Home screen. If I have multiple accounts, can I set different transaction limit for each of my accounts? Yes, you can set the different transaction limit for your multiple accounts, by visiting Account option on Home Screen & selecting your specific bank account. Can I link multiple bank accounts with Chillr? or Can I link my other bank account even if I have registered with Saraswat bank account on Chillr? Yes, you can link multiple bank accounts with Chillr, even if you registered with Saraswat bank account on Chillr. Balance showing in front of my account, is it a live balance? Yes, the balance shown in Chillr is current balance of your particular account linked with Saraswat bank. My account balance is not updating time to time? Ensure that Internet pack is activated on your mobile and restart the app. If still the problem persists, reset the account from ‘More’ & re-register it for Chillr. Do I have to transfer my money from my bank account into a wallet? No, there is no concept of any wallets in Chillr app. Chillr allows you to execute any transaction directly from your Saraswat Bank account. How to send money using Chillr? In Send option from Home screen of Chillr app, select a beneficiary from your contacts, type amount to be transferred along with MPIN on next screen, the money will be transferred instantly. Can I transfer money to any other bank account? Yes. You can transfer money to any other Chillr user registered with other bank. Also you can transfer the money to beneficiary who is not registered on Chillr, by entering account number & IFSC code of a beneficiary in Chillr app. If I transfer money through chillr app, how much time it takes to reflect it in beneficiary’s account? Instantly. Yes, the money should reach beneficiary’s account immediately as it uses the IMPS platform. Will Chillr transaction limit be considered separately from the GOMO Mobile banking per day transaction Limit? No, the Chillr transactions limit is a part of per day GOMO transaction limit. Though the Saraswat Bank GoMo Mobile banking has Rs.200,000/- per day limit, the limit for Chillr transaction is set for Rs.25,000/- per day. Can I transfer money between my other personal accounts through Chillr? Yes. You can add your other accounts as a beneficiary from ‘Beneficiaries’ option at home screen and send money to your these accounts from Chillr. I am unable to receive OTP, why? This is mainly because of two reasons, fluctuating mobile network & the SIM of Registered Mobile Number (RMN) is inserted in second slot. Therefore, check whether you have sufficient mobile network to receive OTP. Also, your SIM card of Registered Mobile Banking (RMN) is inserted in first SIM slot. How do I add other account as a beneficiary? To add other account as a beneficiary, go to ‘Send’ option on the home screen and press ‘Non-Chillr’ tab. Click “Add Beneficiary” and enter the mobile number, a/c number and IFSC code. Or you can simply, Visit ‘Beneficiaries’ option from Home screen & fill up the required data. Can I transfer money to someone who is not registered with Chillr? Yes, you can transfer money to any person who is not registered with Chillr. The beneficiary should maintain an active account in any of the bank. How can I transfer money to someone who is not registered with Chillr? Go to “Add beneficiaries” option on Home screen, tap on “Add Beneficiary”, select the bank name from the list, mention the account number & IFSC code. Chillr will save these beneficiary details for future reference for instant money transfers. Will Chillr transaction limit be considered separately from overall GOMO Limit? Chillr transactions limit will be a part of the daily GOMO transaction limit. I have executed a transaction for Rs.25000/- which was unsuccessful & retuned to my account, now I cannot send money once again? I am getting a error of Daily limit exhausted? The daily limit set for Chillr transaction is Rs.25000/- irrespective of your successful or unsuccessful transactions. The amount of your successful or unsuccessful transactions in a day will be considered under your daily limit of transaction. Therefore, if you have exhausted your daily limit, you will not be able to transfer the money to beneficiary again. What if I forget MPIN? You can regenerate or reset your MPIN via Saraswat Bank Mobile Banking application. Your MPIN for Saraswat Bank Mobile Banking is your Login Pin in Chillr. Can I lock Chillr app or can set password to open Chillr app? Yes, you can set a password to open a Chillr app. On the home screen, click on More & set Application Lock. You may choose lock type and set your lock. You cannot unlock the Chillr app with invalid password. It is another security feature of Chillr. What if I forget Chillr app password? Select “Forgot password” option on the main login screen. You will receive an email on your registered email ID to verify your request to password reset. What if I enter wrong MPIN? If you enter a wrong MPIN during executing a transaction, the said transaction will fail & funds will not be transferred to the beneficiary. Even if you lose your phone, no-one will be able to make any transaction through Chillr without knowing a valid MPIN. If you wish to change your mobile number, visit the nearest Saraswat Bank ATM to update the same. Once it is updated, reset your MPIN for Saraswat bank Mobile Banking app through the same app itself. Further, reset your Chillr account under ‘More’ menu and re-register it with new mobile number. For more information, you may contact the help desk or visit the nearest branch. What if I change my mobile handset? Or What if I purchase a new mobile handset? Download Chillr from appstore & Install it on new mobile handset. Follow the registration process. On successful registration, the previous phone will lose the access. No. For security reasons, you can access chillr app from the mobile in which the SIM of Registered Mobile Number with Saraswat bank is activated. Can I view all the transactions in bank account through Chillr? No, you can view only specific transactions which are executed through Chillr app. 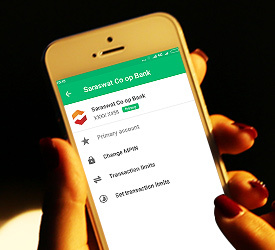 You may view all your transactions on Mobile Banking app or mPassbook app by Saraswat Bank. Can I invite others to download Chillr? Yes, you can definitely invite anyone from your phone contacts through the app itself by selecting “Invite” option. Where I can find my ‘Referral Code’? You can find your referral code by visiting ‘Invite’ option on Home screen. You can invite your friends & earn money by sharing your Referral Code with them. My friend had installed Chillr successfully; I have still not received my referral cashback? If your friend has entered your Referral code correctly & if your friend has completed his first transaction successfully, Referral cashback gets credited to your account within 7 working days. Encourage your friend to complete his/her first transaction to receive the Referral Amount. My friend had executed a transaction; I have still not received my referral cashback? If your friend has entered your Referral code correctly & if your friend has completed his first transaction successfully, Referral cashback gets credited to your account within 7 working days. The referral amount will be credited directly to your bank account linked in Chillr. Can I find who have registered on Chillr with my Referral Code? Yes, Under ‘More’ menu ‘Invite your Friend’ option, you can find who have registered Chillr with your Referral Code. What are the fees and charges for Chillr Support? There are no fees or charges for using Chillr support. It is available 24x7 free of cost. Is there any notification for sending / receiving money? Yes, Chillr will notify you in your notification panel if you send or receive money. All the transactions executed from Chillr app will be recorded in detail under “History” menu for future reference. Also, you will receive an email from Chillr about the details of your transactions. Can I get the details of past transactions? Yes, on Home screen select ‘History’ option. All the transactions with details will be recorded date wise for future reference. How will I come to know, whether someone has paid me or not? A notification will appear on your home screen when your friend pays you. Also, you will receive an email from Chillr about the transaction details for your reference. I have forgotten that whether I have sent money to my friend or not? Whether I have recharge my mobile / DTH or Datacard or not? Can check such transactions? Yes, all the transactions executed from Chillr app will be recorded in detail under “History” menu for future reference. How to recharge mobile, DTH, Data Card or pay bills? Choose from the list of options – Prepaid/postpaid mobile, DTH, Datacard or any wallet. Enter the amount & desired details. Customer’s frequent recharges are saved for future recharge. What is the process for a refund if the recharge transaction fails? Refund will be initiated immediately in case the recharge transaction failures at the operator end. Such refund amount should be reflected in your account within few minutes. If the recharge remains pending at operator end, the refund will be processed within 7 working days. Recharge transaction was successful but top up didn't happen. What to do? This is an operator issue. In some cases, it can take a few hours for the recharge to happen. Contact Chillr through the in-app chat or email query at support@chillr.in. Your money is completely safe & will be returned to your account if recharge does not happen. Can I recharge for my relatives, friends? Yes. You can recharge & pay bills for anyone in your contact list. Select beneficiaries name from the phone number, select the operator and enter the amount to be recharged. What if I recharge the wrong number? If the transaction is unsuccessful due to any reason, the funds amount will be credited to your linked account immediately. Unfortunately, if the transaction is successful, Chillr or Saraswat Bank cannot help with this issue. It is suggested that you should always select beneficiary from contact list to avoid such mistakes. I have paid my utility bill, but it is still showing ‘Pending’ in status. You can share the status, transaction number& biller details with Chillr inapp chat option or send mail on support@chillr.in. Chillr representative will reply you back at the earliest. How to share Receipt of Payment? Once you execute the transaction, Receipt screen will appear. Select ‘Share Receipt’ option & share the same with beneficiary. What is Split Bills option? Each of your friends will receive a Chillr notification to pay back a certain amount to you. How to collect money from specific person? Your friends will receive a Chillr notification to pay back that amount to you. I have sent request for money through ‘Split Bill’, but not yet received the funds in my account? Once you send the requests to your friends through ‘Split Bills’ to pay you back, they have to authenticate the said payment by entering their MPIN. Without entering a valid MPIN money will not be debited to the account & subsequently credited to your account. Also, you can send a Reminder by selecting ‘Remind’ button & start chatting with your friends from particular request under ‘Split Bills’ options. I have received a request from my friend to pay the money to him? You will receive a notification about the transaction details from Chillr. I have sent request for money through ‘Split Bill’, but no one has sent money to my account? Or I want to remind my friends to pay back the money to me. Once you send the requests to your friends through ‘Split Bills’ to pay you back, the request will appear in your ‘Split Bills’ option. You can send a Reminder by selecting ‘Remind’ button & start chatting with your friends from particular request under ‘Split Bills’ options. How to pay via ‘Scan & Pay’ option through Chillr? On home screen, select ‘Scan & Pay’ option. Keep the camera reader on the QR code of store or Merchant. On successful verification, merchant details will appear on ‘Send’ screen, now type amount & your MPIN. Money will be transferred instantly. How to generate QR code for accepting payments in Chillr? You will receive an OTP, enter the OTP & Click on Submit button. I am unable to scan the merchant’s QR code & pay the bill amount to the merchant? Ensure that the QR code place at the merchant’s store is a valid QR code generated from Chillr website. If the QR code is invalid, you will receive a notification in red panel stating ‘Looks like you have scanned an invalid QR code’. Ask your merchant to regenerate the QR code from Chillr Website. Further, you can save your merchant’s Chillr registered phone number in your mobile & can transfer the bill amount accordingly. Under Scan & Pay option, transaction failed but money not yet reversed to my account? If you execute any transaction from ‘Scan & Pay’ option, the amount debited to your account but not credited to merchant or storekeeper’s account, the transaction will be considered as failed. In such cases, you will immediately receive an auto reversal of the amount in your account. If not, email the transaction ID & your registered phone number to support@chillr.in. Under Scan & Pay option, How to ensure that the money has been transferred to Merchant / Storekeeper? If you execute any transaction from ‘Scan & Pay’ option, you will instantly receive a notification from Chillr. Also, you will be able to see the payment details in History menu. Is there any limit to send / transfer the money from Chillr 'Scan & Pay' Option to the merchant / store? Yes, the transaction limit is applicable here i.e. Rs.25000/- per day & Rs.500,000/- per month. Is there any limit to receive the money from Chillr 'Scan & Pay' Option? No, there is no limit to receive the money directly from Chillr ‘Send’ option & ‘Scan & Pay’ option. What is a Bell icon at top right corner represents? The Bell icon represents the ‘Notification Hub’. Chillr requests & notifications will appear here. Can I avail a loan from Chillr? I am getting a notification from Chillr that I am eligible for a credit from Chillr? It is an additional facility that has been offered by Chillr on a specific Interest & Processing fee. Kindly go through the terms & conditions of loan. Saraswat Bank possesses no role & responsibility under this short term Loan option. You can manually apply for the loan from ‘Loan’ option under ‘More’ menu. Can I change the language of Chillr app? Yes, you can change the default English language to any desired language provided in ‘Change Language’ option under ‘More’ menu. How to Log-Out from Chillr app? There is no option to Log out from Chillr. You can ‘Reset Account’ from ‘More’ menu. However, if you want to re-use Chillr, you have to follow the registration process all over again. How to begin with in-app chat with Chillr? Type your query with mobile number, Transaction ID, if any. Also you can attach a screenshot of any particular transaction here. For customer support, Chillr representatives are 24x7 available at free of cost. In-app chat: In-app chat is integrated in the Chillr to provide immediate response to queries. E-mail: Send an e-mail to support@chillr.in, mention mobile number and issue.